Good news if you hope to go to France this summer. THE FOOTBALL ASSOCIATION of Ireland has announced it has received an extra allocation of tickets for this summer’s European Championships. The association’s chief executive John Delaney successfully secured a further 6,502 seats for Ireland fans in France after holding talks with Uefa. The Boys in Green will now have a combined allocation of 32,502 tickets for the three Group E games in France this June. “I am very happy to say that following meetings with Nyon, Switzerland last Friday UEFA have awarded Republic of Ireland fans with 6,502 more tickets,” Delaney said. Earlier this month, Uefa revealed the final number of applications per country with Ireland fans submitting 275,000 ticket applications through the official online portal. Huge groups of supporters are expected to follow the team’s progress in June with the group games against Sweden, Belgium and Italy all still heavily over-subscribed. “Uefa will contact each applicant to inform them of the timeline expected for payments to be taken, while all applicants will be informed of their final status by 29 February at the latest,” a statement released by the FAI reads. Ireland begin their campaign against Sweden on 13 June at the Stade de France. Email “FAI chief executive John Delaney secures extra Euro 2016 tickets for Ireland fans ”. 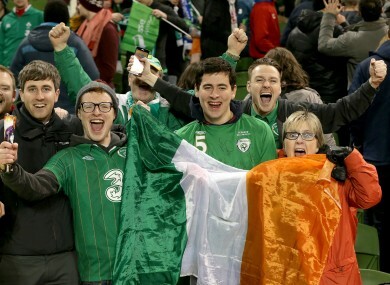 Feedback on “FAI chief executive John Delaney secures extra Euro 2016 tickets for Ireland fans ”.